Chris Craft has been a recognized name in luxury boating for more than 125 years. 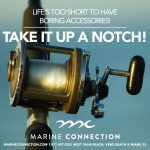 Undeniably beautiful and elegant, any boater would be proud to own one of these legendary vessels. From their conception they have been a symbol of the American dream. Christopher Columbus Smith is one of the true revolutionists of our time. Beginning in 1984, his hard work not only built handmade wooden boats, but a rock solid reputation as well. In the early 1920s, he became the first manufacturer to offer a speedboat. His first one traveled at seven miles an hour, much faster than any other during this time. Using the knowledge gained from observation, he wasted no time improving his designs. Determination and hard work soon paid off. 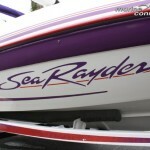 New versions quickly became very successful and dominated the racing boat market. During this period of time, his boats were only outdone by his newer boats. During the time between the World Wars, luxury was the new factor boaters were searching for. Wasting no time complying, soon the company’s boats were even more sought after. Once becoming the first manufacturer to mass produce, the name Chris Craft was born. Their mahogany hulled speedboats were the ultimate symbol of quality craftsmanship. They only accepted the finest wood from the lumberyards. Even though the last wooden model was made in 1972 before the full switch to fiberglass, the same care is still poured into every boat. Beautiful wooden accents are still heavily used. A rather extensive list of famous names chose to purchase the vessels over the years, from Elvis Presley to Katherine Hepburn, even the Vanderbilt family. Chris Craft even played a role in WWII. Ten thousand landing craft were built. Some of the first troops to reach the beaches of Normandy were delivered on a Chris Craft. It would be a pleasure for anyone, an avid or casual boater, to own a piece of this rich history. 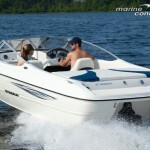 Used Chris Craft boats offer a sense of American pride that would be difficult to rival. Since they were only made with the best quality, they continue to hold on to their value and good looks. From design all the way through rolling them out of the shipyard, more time may be invested in insuring quality in these than any other boat. Chris Craft prides itself on providing six specific qualities in every model: timeless beauty, agile performance, durable dependability, traditional craftsmanship, stylish comfort, and American heritage. One hundred and twenty five years spent constantly rebuilding themselves has produced something for everyone. All different shapes and sizes are out there. 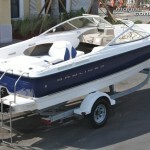 Different considerations may need to be decided when looking for a perfect used Chris Craft boat. Speed, length, and passenger seating can be very different from one model to the next. Someone searching for one of the more iconic versions may want to look into barrel backs and similar styles. Purchasing a used Chris Craft boat is sure to be an exciting event for anyone, no matter what they decide. 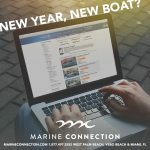 To find the Chris Craft boat of your choice be sure to visit Marine Connection today! Hurricane deck boats have arrived!